Nov 29, 2015. It was an early morning start. 5 am is a sinful hour to check out of a Goa resort. Especially when the preceding night has wrapped up at 2 am! But we had no option. Not unless we wanted to give my cousin’s son’s 5 pm wedding a miss. Only Air India provided a decent Goa-Mumbai-Jaipur connection. The Goa takeoff was fine; it was the Mumbai transit where the drama unfolded. As the plane began its slow taxiing, the flight attendant came rushing “Can you please switch your seats?” Reason? The family sitting across the aisle was traveling with a baby. Which meant that a provision was required for an extra oxygen mask. And surplus breathing masks were available only on our side. We obliged. Our national carrier deserves some breathing room. Then the plane abruptly halted and cruised back to the gate. An announcement blared after fifteen minutes: A technical snag needed attention. A warm lunch was served. One hour crawled by. Then came the pendulum update. Good news: The technical snag had been sorted. Bad news: The pilot had left for the day because he was done with his authorized flight hours!! Good news: A new pilot was on the way. Bad news: There was no ETA for the new pilot!! The doors opened. The sky bridge was stormed. The crowd made it to the locked door at the other end of the bridge. Door hammering was beyond our NRI’s league. It was time for desi aggression. A new leader was born. He threatened the ground official “Sir, kindly open the terminal door. Else we are going to beat you up.” The official shrugged. There was no provision to unlock the terminal doors from inside. That’s when street leadership emerged. A collegian climbed down the stairway adjacent to the plane door. His plan was ambitious. Storm the runway. Stop other planes from taking off. Capture media attention. The crowd cheered. The strategy lasted solid ten seconds. The airport security with their guns did the convincing part. Our new leader retreated sheepishly. All the cradles of leadership had fallen. It was blame-game time. Two camps sprung up. Pro & anti Modi. “Where are our promised achhe din?” came Bihari-accented provocation by a Modi-baiter. “Lost in the sins of the previous government”, a voice from Maharashtra retorted. The slogans started heating up. Thankfully, the new pilot’s arrival came to the rescue. Everybody clapped. All was forgotten. Celebrations galore! Except for a passenger who stuck to her principled stand. She was a well-polished lady. She had been demanding through the commotion for her checked-in bags to be unloaded. ‘Boycotting is the only way to teach Air India a lesson,’ she had repeatedly declared. She claimed to be a TOI journalist, one who intended to head straight to the press and deliver a first hand account of the misadventure. A senior Air India official was summoned. The official explained that searching and unloading her bags would delay the flight by one more hour. But the journalist refused to back off. Additionally, she had reservations on the reliability of the new pilot! A Chinese traveler panicked at her pilot inference, and wished to disembark as well. Helpless, the airline official conceded. The offer to disembark was extended. Ritu and I took up the offer. The three-hour circus had ensured that our wedding rendezvous was history. Ritu and I giggled nonstop on our drive back to Pune. Who was the hero and who was the villain? On one side was Air India who majorly messed up but still tried its limited best to serve—oxygen masks, warm lunch, honest announcements, patient tackling, appeasing demands. On the other side was our new friend who intelligently manipulated the system to service her personal ends. She grounded a flight full of frustrated passengers for an hour by invoking her principled stand! Hop, Skip, and a Dump! be having the head and the heart in the wrong places. Thanks again for the amusing read. The greatest evil is when you do not go with your gut feeling. Your gut feeling is always correct because at the back of the mind and heart it has done lot of calculations to come to a particular conclusion. A gut feeling is always the right mixture of brain and heart being at the right place…if it is not your gut feeling the mix is somewhere wrong and may harm you somewhere. Thanks for such a wonderful write up…. I wonder, in my life I was not able to get caught in such a incident which make you feel happy, sad, anxious, surprised at the same moment which had happened with you. Its proud moment for you I guess, as it leaves you with a question of “what do we listen/choose from at times between Heart and Head?”. I guess, HEAD Wins here. As our creature has provided us with Heart and Head as well but being Head on TOP of our BODY, which possibly means that, whenever there is situation like this in which to struggle between Heart and Head, WE (Humans) take responsibility to make decision with Head(written in Bhagwat Gita as well). But this doesn’t mean that we should stop listening to Heart. Its just a matter of time and incident which create situation to choose from. Wonderful entertainment to start new year eve celebration and classic narration of the drama. Enjoyed reading as if watching it happening. Yet! Air India did it again… so consistent. For the answer, if we have multiple choice I think its wise to keep both head and heart at right place in all walks. If we have only one choice to make I believe having head at right place when we ACT and keeping heart at right place when we REACT will be lesser evil. Both are equal evil. When either of the two supersede we are not completely in control of the situation. The best (and ideal) case to handle any situation is when the heart & the head are synonyms. Situations, “Heart in the right place, but not the head” & “Head in the right place, but not the heart” are equally damaging for society and business. Since it damages, it can be termed as evil also. In the given situation, both of the combinations created only hassles. We also know that every action has its reaction, may be in near or distant future. Giving head or heart a precedence over the other and concluding on situations can prima facie make us choose an option which looks more rewarding. Making choices like this will always result in short or long term hassles and frequent unrests within the self. Fight of mind and soul! If we accept the theory above, then what is the way out? I think we should have our soul (heart) and mind (head) in sync. Do anything, if only both of them permit; else don’t. If this should have been exercised by both Air India and the lady; the day could have been more rewarding and joyful for a lot of people including themselves! Nice Read and very tough question to answer indeed! In my opinion, having HEART in right place is a lesser evil in business and in society than having HEAD in right place. Whether we go with “All Heart” or “All Head” way, it is certain to waive off/ignore some corner cases deliberately while making a decision based on perception/earlier experiences. However I think, cases ignored/waived off by HEAD may be very critical/regretful than HEART ones if our decision happen to be incorrect/evil one. (As they say – To err is human). Is it because your heart is fiercely loyal to our national carrier? Or is it because your head makes logical decisions based on the most convenient flying option, even if it means going against the skepticism of your heart? Ultimately I personally feel the best decisions are those that are triggered by intuition, substantiated by practicality, strengthened by reason and validated by emotion. 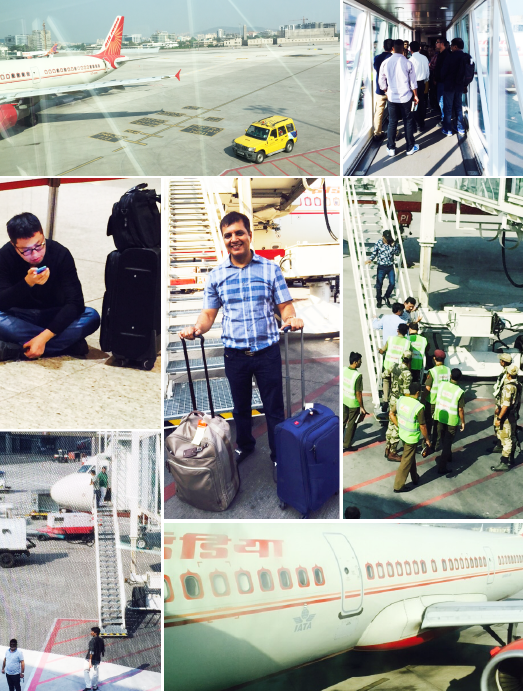 Irrespective of whether the flight takes off, whether the bags arrive or not, your Air India experiences certainly morph into interesting blog reads! Here’s wishing You and our entire Cybage Family a very Happy and prosperous 2016. Thank you yet again, for a nice, interesting and entertaining blog at the start of the year. Both the above situations are evil, a person is in dilemma both the times and it seems like a nature’s law after so many years of living on this planet that it’s very rare that both heart and head agree to the same situation at the same degree! The best example of this situation is when a girl and a boy are taking a decision to get married. The heart and the head never agree on the same decisions, what needs to be done is bring both of them to an understanding somewhere in middle and then come to a conclusion keeping all the pros and cons in mind. That is why it is righty said “if you even have half a mind to get married, get married that is all that is required”. When one listens to the heart the head is usually not happy and tries to stop us several times. When one listens to the head the heart does not stop you directly but creates a very strange unexplainable fear in a person. Heart creates a fear such that a person cannot get the answer to the very basic question “WHY” which makes a person panic more. 1. What result they want to get out of the situation. 2. They also take into account which decision of theirs will affect whom, how many people and in which way. 3. People try very hard always to find out a middle way where both heart and head are happy. 4. What are the pros and cons of choosing which evil etc. the list goes on. One has to choose between two evils because no matter what decision a person takes (even the smallest of the decisions like what is going to be cooked for Lunch / dinner today?) one cannot please everybody there would be someone or the other who does not agree with the decision and is unhappy with it. All this thinking is mostly processed in the human body within fraction of seconds / few minutes and thus goes unnoticed in our day to day lives; however when such a major situation pops up involving a large number of people this dilemma becomes prominent, interesting and entertaining. Really a nice blog again. Actually both are good at their places. It completely depends on the situation and our logics which decides when to use heart and when to use the head. Dripping water hollows out stone, not through force but through persistence. It is not easy to make an elephant dance, let alone the Maharaja’s elephant. The “ONLY SUCCESSFUL LEADER OF THE DAY” did her bit and hopefully polished a bit of the rough cut stone. And helped few passive passengers along the way by starting the disembarking process !! I think in business scenario, having the head at right place is most important, but in social aspect any two should work depending on the situation. We Indians are quite emotional and love to take decisions from the heart, infact logical and practical decisions are considered heartless many a times. In your previous blog, you have written about establishing relationships of the heart and connecting beyond professional relationships. The key aspect is that decisions made completely from the heart may have a short term benefit or may not consider the well being of a larger group. Hence it is very important that the head camouflages this making the heart feel that it is still his decision but in the background it has been influenced by the logic and data. This is what I believe is also termed as gut and intuition because sub consciously you are using a lot of data, past experiences to make a decision which seems instantaneous and from the heart but actually is not. And this applies to professional as well as personal life. Your blog is an amazing journal of your expressions. There is no need for an individual get stuck in their head or in their heart, what is required is to be able to be flexible to slide back and forth to an extent as the need arises. I believe none of the two is evil. Evil is the intention of the individual and both aspects can be applied. Interesting blog Arun, very well written. As I come our of the aura of your writing, my head is still there. It is not about right or wrong, it is about individual choice. Heart makes us react, while the Head helps us respond. If you still push me to choose one, I will choose heart – simple reason, to preserve humanity. It is matter of time head will be cloned..!! Made an interesting read. Either the heart or the head, I feel it is the objective that matters. In this particular example, I don’t think Air India had much of a choice while all the passengers did. The only difference, one of them took the choice and convinced a few others to join in as well. The beauty of the human life is the freedom of choice and how one is accountable for the exercising those given choices. Neither the head not the heart is the root cause of any evil, the good or the evil is outcome of the decision undertaken, which is the sum weightages of the choices made; that is the consequential outcome. My view is that it is important not to trample on other people’s freedoms in pursuit of our own. The one, who goes along with only heart, will face many complications in life. The blending of heart (Emotions, feelings, culture) and head (reasons, pros and cons) will be the best for business and Society. To deal with any situation its best that heart and head will be running together. Very impressive explanation. I like to add one more point here, When you feel, that situation is not up to you then we need to give up the things to our almighty. Because you are not perfect every in time taking decisions, but Almighty is. We should first ask him whether i need to leave this decision on you or not. If your heart & Head says ‘Yes’ then go with it without any second doubt. After all he is the creator of our Head and Heart. Coming to question of what is more damaging to the society and business bad heart or bad head?I believe both are equally damaging to the society and self as well.Individual has to have good heart and good head for him/her and society to prosper.Heart is where the intention is so if that is bad then it is wrong from beginning and head is where the implementation of intention lies.So even if the intention is good but implementation is poor then results are going to be equally disastrous. I think there is no conflict between head and heart.For any situation action should come out with diligent application of both head and heart! When dealing with the question of which one is the lesser evil, there can be two answers – In a Utopian world, one would definitely say that both head and heart should be in the right place. But, unfortunately ‘Pragmatism’ does not hold a citizenship of the Utopian world. Now, if we look at the situation from the glasses of pragmatism, everything boils down to only one thing – What options do you have? From the Air India’s perspective – As much as they wanted the passengers to be fooled by randomness, somewhere in their hearts(or heads!) they knew that their passengers are smart enough to understand that such an epic failure cannot be just an act of randomness. There has to be a series of intentional or unintentional acts of negligence, procrastination and/or poor risk management for a failure of such monumental proportions to happen. Just like everything doesn’t ‘Fall in Place’ randomly, everything cannot ‘Fall Apart’ randomly too :). So, effectively, Air India had no better option than playing the honesty card. So, while the national carrier still sits calmly and marinates in its own mediocrity, it gave some of its passengers, a feeling of solace by this act of honesty or right heartedness. To sum up, I would say, to ‘Wish’ for the ideal combination of a good heart and a good head is okay but if you ‘Wait’ for it and delay your decisions, that’s the worst mistake you can make – both in life and in business. Whether a decision turns out to be good or bad, is a matter of hindsight but you have to take the best decision, assessing all the available options. Because, the only decisions you actually regret in the longer scheme of things are the ones you never took! As usual, a very nice and a thought provoking article – thanks for writing it! IMHO, one must learn to strike a balance between the heart and the head. Following just the head or just the heart isn’t a sign of good decision makers. Those who learn and master this art of balancing the head and the heart before taking the decision would definitely be successful in all aspects of their life. After all, the business and the society both need such integrative thinkers who know how to listen to both, the heart and the head! Thank you. I rememebered that film when i was reading though the blog. here i guess main hero was the new pilot who arrived there and make everyone to take long and relax breath. Business decisions need to be made with the head but with the heart in the correct place. Business decisions need to be pragmatic but they impact people (promoters, suppliers, clients and employees) hence they should be made with the bigger picture in mind. I think the trick is to utilize the space between the stimulus and response and make the most rational decision. Once again, loved the blog! When it comes to doing good business head should take its firm stand but the heart in the business’s stakeholders, in this case are the passengers. But in times when we find ourselves walking a fine line between these two where a fall on either side will do no good. In such cases always choose the lesser of two evils. Damage control is of less hassle that way. Air India did take certain damage control steps in this masala filled anecdote on instances with extra oxygen mask, resolving technical snag, replacing the tired pilot with the new one! I know they are not wow factors of their service but as per mandates, the timing of it all was poorly managed. If the tired pilot was to leave, the next one should have been ready to take the helm at reasonable ETA. Threat of negative media exposure would rattle any business and their decision taking ability. Though Air India is not new to being exposed in the news for all the wrong reasons, this time the official budged because maybe he felt the agony of the journalist as passenger or maybe didn’t want to be part of another news article or maybe he just chose the lesser of two evils and stranded a flight full of passengers to off load the journalist who probably had a ‘Live and Let Die’ attitude. The head and the heart are not necessarily evil and when used in right combination, are capable of doing plenty of good. After all it’s the Good in the end that can defeat the evil. So if we hope for the Best and Prepare for the worst using both the Head and the Heart we are well equipped to ward off the evil and end up doing a good Business! The heart and head can be at right place to make right action. And, right heart can teach head for right and right head can teach heart for right.